Bone-dry tumbleweed careens across the highway. We are traveling through the Warm Springs Indian Reservation, a vast high desert of parched canyons and grasslands adorned with rocks and scrub and an occasional pine tree. The weather forecast calls for a high of 90 degrees, inspiring us to change our plans for the night. Instead of camping on the outskirts of Bend, we push on, seeking cooler temperatures in the mountains. 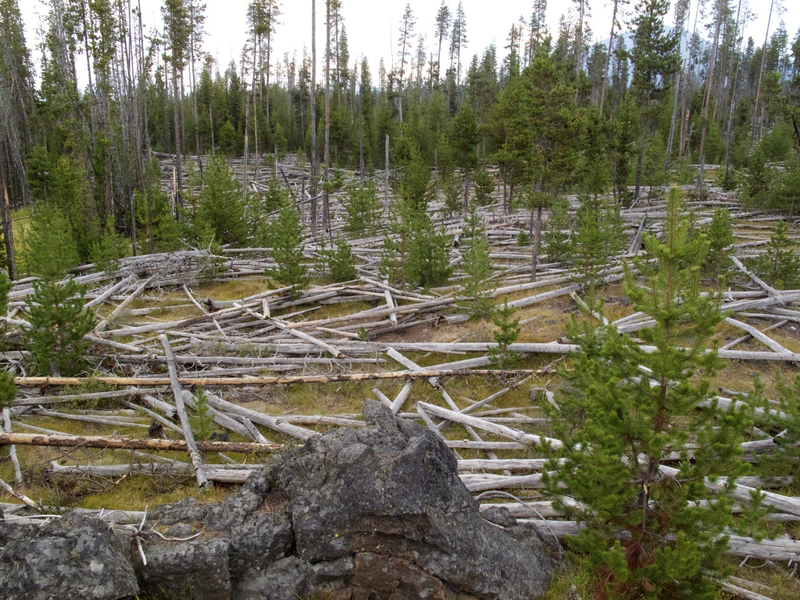 Past Mount Bachelor, the scenery changes into a monotonous tract of pine trees bereft of undergrowth. Almost spooky. No flowers, no bushes, only spindly Lodgepole pines stretching away in all directions. Dark thunderclouds mass overhead. Our destination is a series of campgrounds and volcanic lakes tucked into the eastern slope of the Cascades. The first place we try is closed for the season, the second is littered with slash piles. A dirt road leads to our third choice, a place called Lava Lake. By now it’s early evening. We make camp in a clearing of sparse pine trees, while a short but intense rain shower tamps down the dusty ground. Eager to stretch our legs after driving all day, we set out for a walk beside the lava-ringed lake. Heavy gray skies threaten more rain. Hairy black moss cloaks the pine trees, as if someone has draped the boughs in mourning crepe. Dead trunks sprawl across the trail. Dave turns back, leaving Basil and me to continue on our own. An eerie quiet pervades the sickened landscape. After about a half hour, Basil and I head back to camp too. This place will not be on our list of favorite campgrounds, but it’s better than sweating it out in the desert, and we’re that much closer to Crater Lake, next stop on the Odyssey.